It wasn't a fiscal cliff but the market did slow. However, the mitigation is consistent with past holiday incentives and clearance sales hangovers. 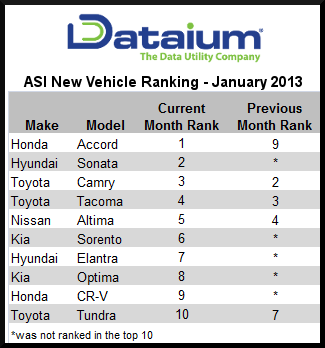 Dataium, the largest aggregator of online automotive shopper behavior, today released its monthly Automotive Shopper Intensity (ASI™) report. The ASI index, a leading predictive indicator of automotive retail sales, was relatively flat in December, up by a mere 0.39%, indicating a slowdown in January. 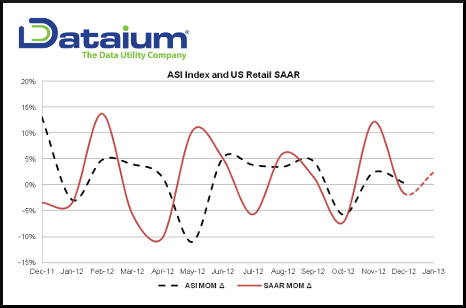 Based on this, Dataium forecasts the US Retail SAAR in January to be 12.2 million retail units. Eric Brown, CEO of Dataium noted, "It wasn't a fiscal cliff but the market did slow." He added "However, the mitigation is consistent with past holiday incentives and clearance sales hangovers." Dataium provides data and research on auto shopper/buyer behavior nationally, and by specific makes, models, vehicle segments, and markets. The index has been proven to be very accurate in predicting future trends, consumer intent and desire, along with new model entry success or failure. The national ASI report is available for download at http://www.dataium.com/library. Dataium reports and dashboards are available on a subscription basis or may be customized to access real-time updates to measure in-market behavior, sales forecasting, advertising effectiveness, digital marketing performance, and website design proficiency. 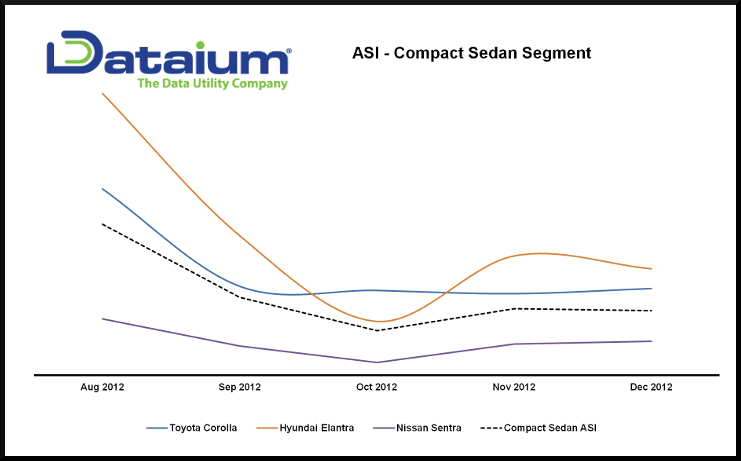 To request complete access to Dataium's ASI predictive modeling tool on future consumer demand by make, model, trim level, segment, region, and market, contact Dataium at http://www.dataium.com/contact. Dataium is the largest aggregator of Internet automotive shopping activity. With its Cloud Intelligence® platform, the company collects, analyzes, and indexes billions of online automotive shopping events from over 20 million active auto shoppers monthly. The company supports cutting-edge data collection and reporting technology; VisiCogn® Knowledge Center, and is also known for its ASI™ index. For more information, visit http://www.dataium.com, email: info(at)dataium(dot)com, or call 877-896-DATA (3282).